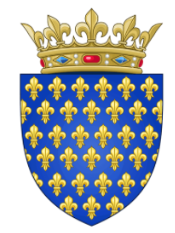 Louis IX, the French King later canonized as Saint Louis, ordered the establishment of several professional guilds, including the Ayeurs (goose roasters). During King Louis XII's reign, this expanded to include the preparation of meats & poultry; hence "Rotisseurs". The coat of arms was created featuring 2 crossed spits & 4 larding needles surrounded by flames. The guild cultivated & delevoped culinary arts for 4 centuries, until abolished during the French Revolution. Louis Giraudon & Marcel Dorin; & journalists Jean Valby & "Prince" Curnonsky (aka Prince of Gatronomes). Our new logo incorporated the former historic shield, encircled by fleurs-de-lis & chains. The inner chain represents the turning spit & outer chain, the bond of comaraderie that binds us together.